Attendees of the 2017 Fast Company Innovation Festival can learn about some of UCLA’s Optimists. To raise the profile of UCLA’s influence in generating ideas that shape the future and in developing solutions to critical societal problems, the university is teaming up with Fast Company for the magazine’s third annual Fast Company Innovation Festival, taking place throughout New York Oct. 23–27. Some of UCLA’s most-accomplished faculty and alumni are on the bill of the business magazine’s weeklong event, whose theme, “Leading with Optimism,” brings together personalities from the worlds of business, technology, design and entertainment. A panel discussion “How to turn your pipe dream into a creative pipeline” will feature Jeff Burke, associate dean for technology and innovation in the UCLA School of Theater, Film and Television, talking about his team’s projects that unite art, technology and engineering; and sustainability event expert Jaime Nack, alumnus and founder and CEO of One Drop Interactive and president of Three Squares Inc.
Also on the agenda: “To boldly go: Creating tools that expand your universe,” an interview with UCLA’s renowned astronomer Andrea Ghez. 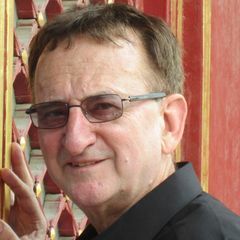 The one-on-one interview will be followed by a networking cocktail party with Ghez. 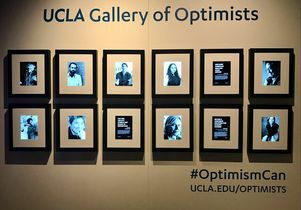 In addition, the event will feature a “Gallery of Optimists” display that highlights content from the ongoing UCLA Optimists marketing campaign. 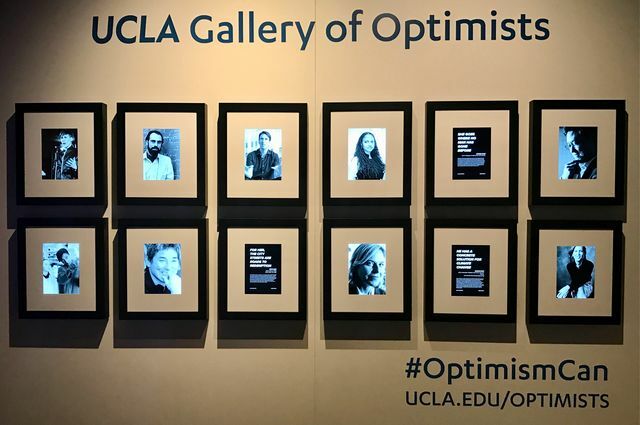 Bruin Optimists featured in the gallery include Dr. Kelsey Martin; Dennis Hong; Vincent Cerf; Jorja Leap; Dustin Lance Black; Adam Cheyer; Ava DuVernay; Guy Kawasaki; Tracy Johnson; Gaurav Sant; Susan Wojcicki; and Ghez. The Innovation Festival draws 10,000 tech and other entrepreneurs annually. Besides the UCLA experts participating, this year’s speaker list includes actress and entrepreneur Jessica Alba; UNICEF CEO Caryl Stern; Walmart.com president and CEO Marc Lore; chef and restaurateur Mario Batali; and “Good Morning America” co-host Michael Strahan, among others. Gallery of Optimists at the 2017 Fast Company Innovation Festival.